*I did a major overhaul on Oct 5. At that time it was LR 101,282 with 23 visits in the last week. And even that was high. It will still need a little more to cling to this tier, because those Likes are going to wear off. But after having a lens get 80+ unsolicited likes in 2 weeks, tons of blessings, and still not achieve Tier One, I know the likes aren’t the reason this lens reached Tier One. Much more content. [BIG FACTOR] Search engines need keywords to index and send traffic to. People need stuff worth reading. Improved quality of content. I thought a lot more about what’s most essential to the topic, what visitors searching for this topic would want FROM the page. I used traffic search stats for clues about what people were looking for. Improved style of content. For me, this means pruning my long-winded prose and shifting from a dry, overly-detailed, academic style to a direct, casual, and occasionally funny style. Others may need to do spellchecking, proofreading, and smoothing out grammar and tone. MAKE IT SIMPLE. Adding content causes lens bloat. I would add more, then go back and prune, prune, prune. It’s like creating a bonsai by piling on tons of fertilizer, then snipping away all but the very best branches and leaves. I kept asking myself: what are the most essential things to know or cover on this topic? Does this module serve a purpose, or can it go? This sentence? This picture? This link? This word? Can I find a better one? 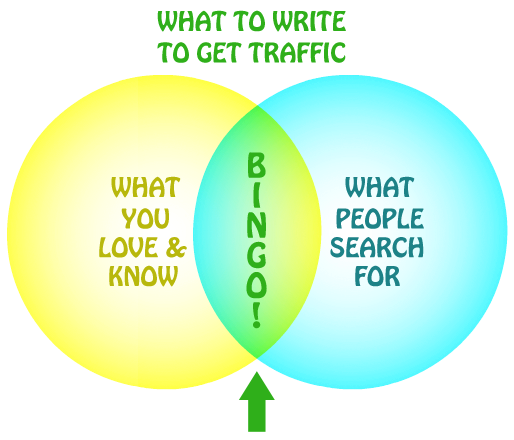 Traffic stats’ search queries help steer me on what content is most essential. Make it FUN. The quiz on this lens was hard. I altered it so that people could get more right answers (or, if they wished, cheat by skimming down the page). For hard questions that I was using to convey an essential piece of info, I made at least one funny wrong answer so people could laugh even if they were stumped. Improved CSS and graphics. Better-looking, eye-catching, beautiful graphics took some hunting. I scoured Wikimedia Commons and Creative Commons photos I could use. On-page keyword optimization. All headers, links, image file names, alt-text, were considered. Did they target one of the primary or secondary search terms I’d decided were important for this page using Squidoo SEO? I also targeted “related searches” in the body text and a few places. Creative Commons. People search for images. They are likely to click on those images. And Creative Commons must have a link giving credit. So… lots of clicks. Variety of Media. I included links to recordings of music and videos. CROSS-LINKS TO OTHER RELATED LENSES. [BIGGEST FACTOR] I have a whole series of similar lenses. I improved every one, more or less, as above, they all link to each other, and I built 2 new lenses. Total traffic across all these lenses went from about 20-40 a week. As of today, it’s 812 and still climbing as more and more search engine traffic, social book marks, and other traffic sources kick in. Link priority on this lens. By putting this lens in a prominent place on my lensmaster profile, as well as (most importantly), putting it first in the navigation bar for all its slster lenses, it gets visits from people clicking on the first link in a batch. OPTIMIZED GOOGLE SNIPPET. Getting your lens to rank well in search results is great. Then you want every WORD of that search result to tell people “here’s what you’ll find on my page, setting it apart from all these other search results.” Don’t say, “my page is the greatest!” Show them it has what they’re looking for. Then deliver on that promise. Submitted RSS Feeds to Feedburner and some Feed Aggregation sites as recommended by TheFluffanutta. This included making a Yahoo Pipe combining several of my mythology lens feeds (again, following Fluff’s tips and help) and submitting THAT feed, too. Links from my IMPORTANT related sites/blog. These are more important. My Myth related blog: a link to the lens is now in the sidebar. THIS is a relevant link, with pagerank, reinforced with each and every post and page on that site. Links from Flickr photos (could be any assets you have on a large social/content-sharing community). The lens is on Athena. I have my own, original photos of Greek art posted on Flickr. Flickr photo descriptions are NoFollow, but people see them. So I write links to the effect of, “For more images of Athena in Greek art, plus fun facts, mini-myths, trivia, check out….” This blurb is tailored to the audience of my Flickr photos. Likewise, whenever I used a Creative Commons image, I left a note saying, “Thank you for making this Creative Commons! I’ve featured it on [lens url].” These are purely to attract people. They have only attracted a trickle, though. Links from related communities where I’m active. Not too many. I can’t spend my “goodwill currency” by advertising all the time. But I shared it in some mythology livejournal communities where I’m a member. A small trickle of visits from there. Submitted to StumbleUpon, Digg, Lensroll.com. Only SU has given a little traffic. Wrote associated content articles off-site. Only one, since Hubpages rejected the other, but I created and linked from a relevant article on Gather.com. Submitted to international search engines. Just 3. In some countries, search engines aren’t as efficient in finding/crawling content daily, so they still accept and are influenced by submissions. No direct traffic from this, except now I get Google Translate traffic…hm. Solicited backlinks from relevant pages. Not too much of this. I’ve contacted about 5 teachers with educational webpages on my topic, offering my lens plus recommending a great wesite (not mine) which they might want to add. I haven’t gotten results yet here. Links from some of my random “web presences.” These are Web 1.0 sites I’ve haven’t touched much since the 90s, forum sigs or profiles on old fan forums where I’m not even active now. Some are slightly more relevant: I’ve got Cafepress shops with Athena designs, so I put links there. None of these places show up as backlinks. Apart from being across many domains, these are very low-value, low-relevance web footholds, but I’ve got ‘em, so I might as well use them. Solicited visits from friends and relatives. My private LJ page. My aunt. My aunt shared the link with some of her friends, and one of them passed it to her daughter, and her daughter seems to have Facebook Liked another of the Sister Lenses, and it’s starting to climb in the Facebook ladder of popularity. Any little social link can take off, but they’re not dependable. Phew. Looks like a lot? But you’ll note an awful lot is improving the lens, or improving and cross-linking my own content around the web…leveraging my own web assets. I hate spending much time on any kind of linkbuilding which is not also improving my own web assets (unless it’s to help people — but of course, reputation is a huge web asset). If my stuff is good enough, other people will start linking to it anyway. This is a really SLOW way of achieving web success. But over time, I’ve got more and more quality content that’s searched, visited, read, relevant. This challenge lens is just another step in that ever-evolving process. I used it as a practice exercise, a self-test, to review and refine my techniques. I get so much from reading anything that you write. I have tried to use some of your tips here to get some of my pages out of the basement on Squidoo. Tis a challenge. Thanks for the learning! I know it’s not easy. I was frustrated when I started about how little traffic I got. It seems like you write the best articles you can, and then no one finds them. So I made it my goal to find every way I could to earn visitors. I’m still learning. I hope some of what I’ve learned can help others get there faster.